In the time it took to download and open this eBook, you could have spun up and configured hundreds of virtual machines in a public or private cloud, deployed your application, database, middleware, messaging, load balancers, storage, and other components to those configured servers, linked them all together, and had your app live in production - all with a single click. This isn't the future we're describing, it's right now, and thousands of development teams around the world are doing it. At a high level, we;re describing automation that cloud and API's enable, and at a low level, we're describing the outcome of adopting a DevOps mentality and the associated tooks. 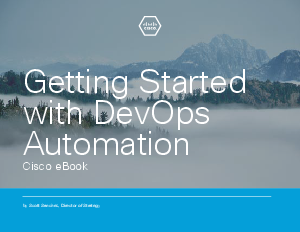 This eBook will look at the basics of DevOps, automation and configuration management to get you started down the right path.